This article assesses the extent to which our conceptualisation, understanding and empirical analysis of ecosystem services are inherently gendered; in other words, how they might be biased and unbalanced in terms of their appreciation of gender differences. 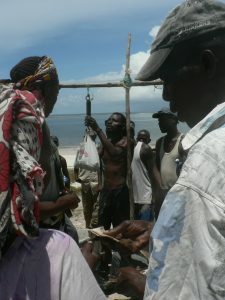 We do this by empirically investigating how women and men are able to benefit from ecosystem services across eight communities in coastal Kenya and Mozambique. Our results highlight different dimensions of wellbeing affected by ecosystem services, and how these are valued differently by men and women. However, it is not just the division of costs and benefits of ecosystem services that is gendered. Using a heuristic device of the ‘ecosystem-wellbeing chain’, we explain patterns within our primary data as an outcome of gendered knowledge systems, gendered behavioural expectations, gendered access to resources and gendered institutions. We conclude that this holistic, gendered understanding of ecosystem services is important not just for how ecosystem services are conceptualised, but also for the development and implementation of sustainable and equitable policy and interventions. All information including publications, conference presentations and news items related to culture and the coast is tagged below. All information including publications, conference presentations and news items related to access to ecosystem services is tagged below.